They say you can’t put a price on love, but Netflix CPO, Neil Hunt, recently put a price on the value of better recommendations for his customers, and that figure is half a billion dollars. Neil Hunt is pretty spot on, you don’t want to be preached to. The most powerful recommendations are those you inherently trust because they reveal their underlying logic. Many systems leverage black box technology driven by complex algorithms or based on simple rules. Black box applications don’t allow your intuition to complement machine computation and result in irrelevant “You may also like” recommendations, while the basic approach feels forced and overly simplistic. Combining sophisticated machine learning technology and intuition, Wine.com leveraged the flexibility of the Relevance Cloud to implement unique selling strategies that directly combat the pitfalls associated with black box and rules-based systems. After implementing RichRelevance recommendations across their site, they noticed that some of the unique qualities about selling and buying wine also make it slightly more complicated to recommend. For example, many people repurchase the same bottles and often purchase in large quantities; upsell/cross-sell strategies tend to recommend popular products since there really is only one product to sell – wine. With this in mind, Wine.com began to develop strategies to address the particular nuances of their product set. Starting with a ‘Similar Products’ strategy, they offered recommendations that keyed off attributes unique to wine, like varietal and region preferences. 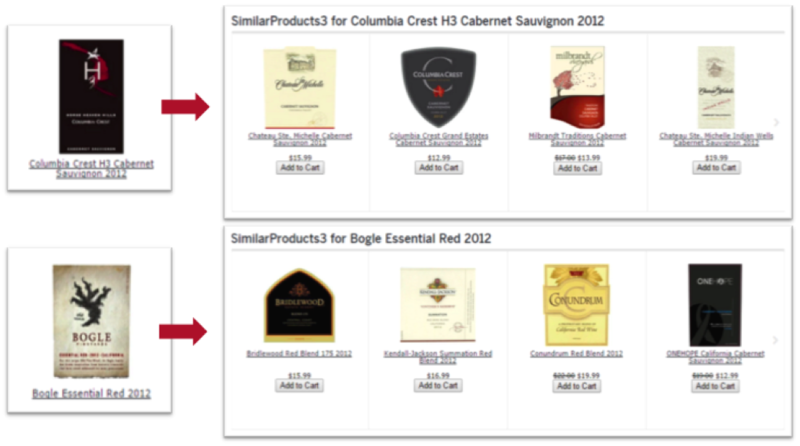 With strategies like these and other personalization efforts, Wine.com has generated a 15% increase in average order value and $5 revenue per click [View the case study here]. Cam Fortin, Senior Director of Product Development at Wine.com shares how he implemented his own strategies in this webinar. When it comes to what works, everyone’s path to personalization is unique. Many vendors offer canned personalization that can be simply turned on. In today’s competitive marketplace, it is imperative that you are empowered to build a relationship with your shopper that is best-suited to your unique business and affords you the ability to test and implement creative personalization tactics. You need to innovate with agility, which is why we brought tools like “Build Your Own Strategy” to retailers like you, eliminating the need to wait on someone else to do the work for you. Creating the most personalized experience possible requires adherence to one simple principle: respect the shopper. A modern personalization platform should give you the control over your recommendations to deliver experiences that are unique to you and respectful to your shoppers. With an open platform technology, you’re able to analyze and activate your own data in real time to develop more relevant recommendations that drive higher engagement, stronger relationships, and ultimately, revenue. Contact us at personalize@richrelevance.com to learn how you can bring human intuition into your recommendation strategies.